(Seen at the first preview performance on 8th December 2018). 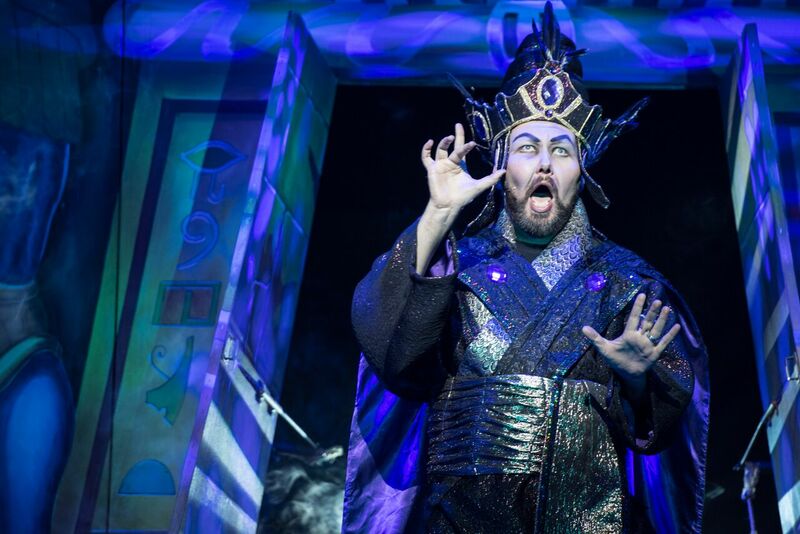 Under the management of Qdos Entertainment, the New Wimbledon Theatre pantomime is fast becoming the “pantomime driving test centre” for bigger stars venturing into the world for the first time. Last year Al Murray passed with flying colours on his debut. 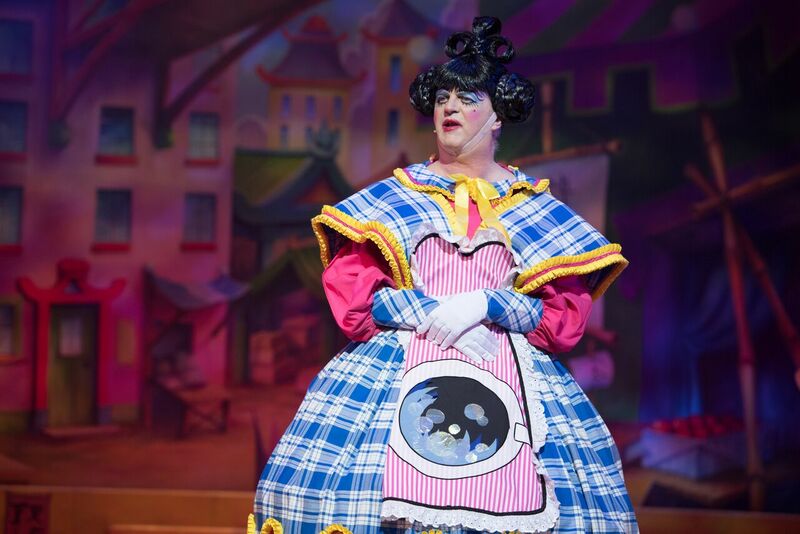 This time around, it is one Paul Merton in the dress and driving seat as Widow Twanky in this tale from Old Peking. At the dawn of the “alternative comedy circuit,” I spent many happy hours at the Comedy Store’s second venue – under Leicester Square, watching the droll, laconic and fanciful Merton and friends in a venue where nobody was more than a few feet away. On “Have I Got News For You” his face fills the screen in many a home. Can he scale up to a 1600 seat venue, and reach an audience of all ages? The answer is that he still requires “P” plates, really. Unable to memorise the entire script – but improvises beautifully (something that bit him hard in the second half when his relentless mockery of another actor’s ‘corpsing’ in act one was repaid with her requirement to prompt him in act two). Also, highly questionable adult joke shouldn’t be covered with “ask your parents,” underlining the main point that he just didn’t connect with the younger audience in the way co-star Pete Firman (Wishee Washee) made look simple. Merton did manage some excellent asides, local references, and one long (frankly superfluous and time-filling padding speech) well enough, but he lacked the camp extrovertness required to sell the classic “man as a woman longing for a man” required of all great dames. That he was willing to try hard, though, is firmly to his credit. By the end of this run, he may get there. “Son” Pete Firman built a good rapport with his “Mother” and also the audience, achieving the rare feat of having his greeting returned throughout the show rather than petering out (no pun intended) by the interval as most do. Thus he can be forgiven a genuinely awful “shoe-horned in” tired bunch of magic tricks – one malfunctioning “big box illusion,” electromagnetic handcuffs and one dull ‘audience interaction’ card trick where the volunteers were funnier than he was. Lacking the club experience of Paul Daniels to weave it in, he unsportingly kept them off-microphone and didn’t repeat anything for our benefit. 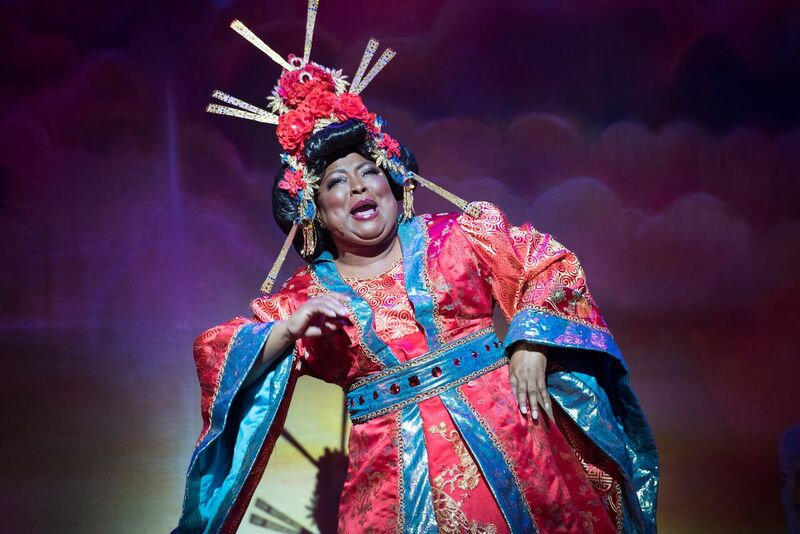 Empress (Linda John-Pierre) has the right imperial bearing, and does a nice second act turn as game-show compere. Daughter The Princess (Lauren Chia) has a sweet toughness too. If a rather unedifying decision by the show’s designer to put her in pink and THEN show her as a tough fighter “girls can too” is a rather mixed message, no matter, the lady did well in her brief scenes. 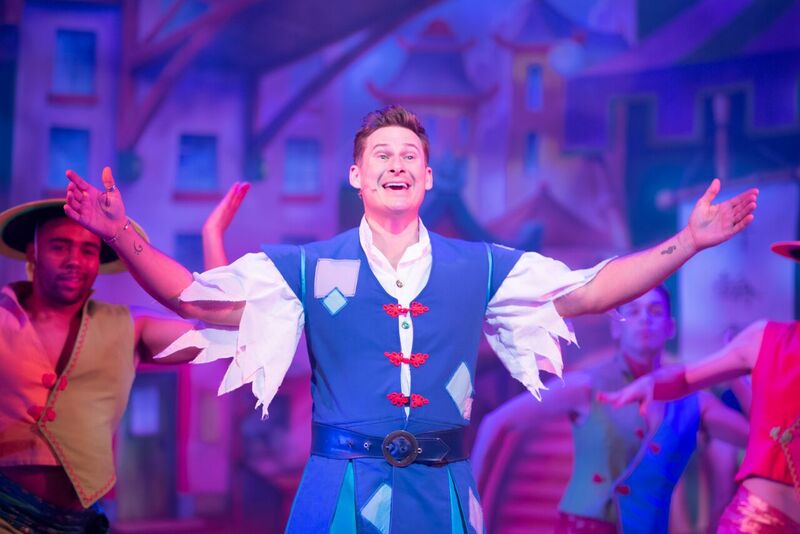 That Aladdin (Lee Ryan) in a “nice but dim” way ended up with her is fair enough, that too is expected. Shame director Kerry Michael couldn’t find the pair more to do than the old “falling off a wall” routine and make more of their voices. 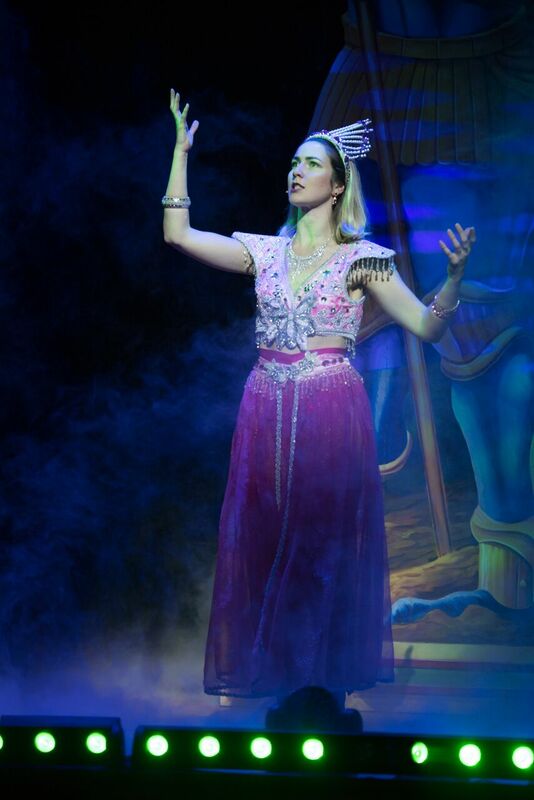 Best of the team were Abanazar (Adam Pearce) and Scheherazade (Cassandra McCowan). 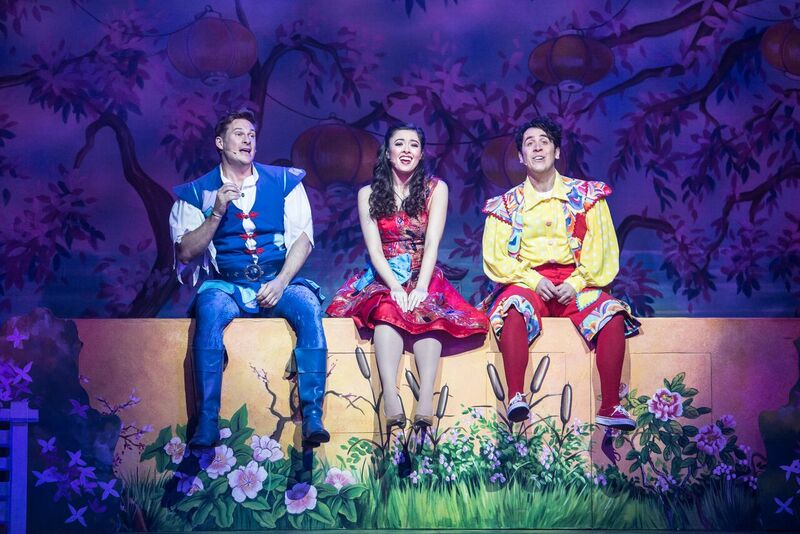 This pair truly understand panto, and had the audience with them from the start. Pearce managed a delightful villain that never lost audience sympathy. 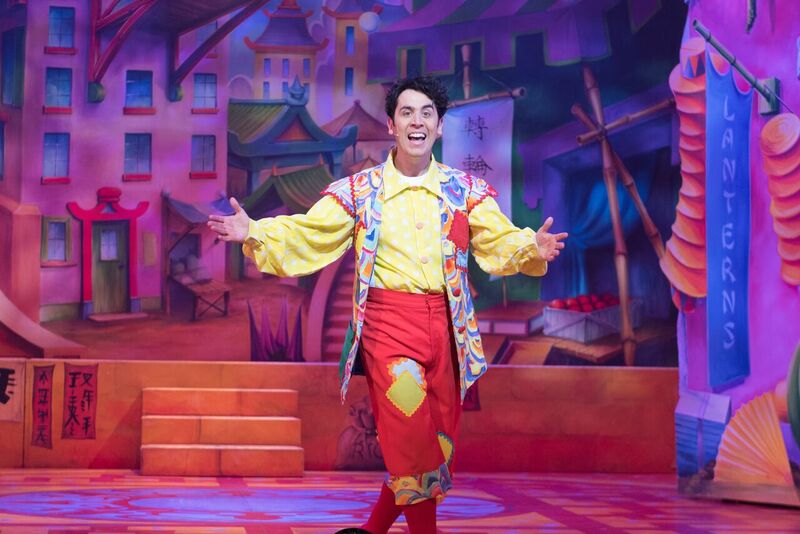 His regular taunting scenes drew massive audience reaction and the man is a born panto baddie for life. 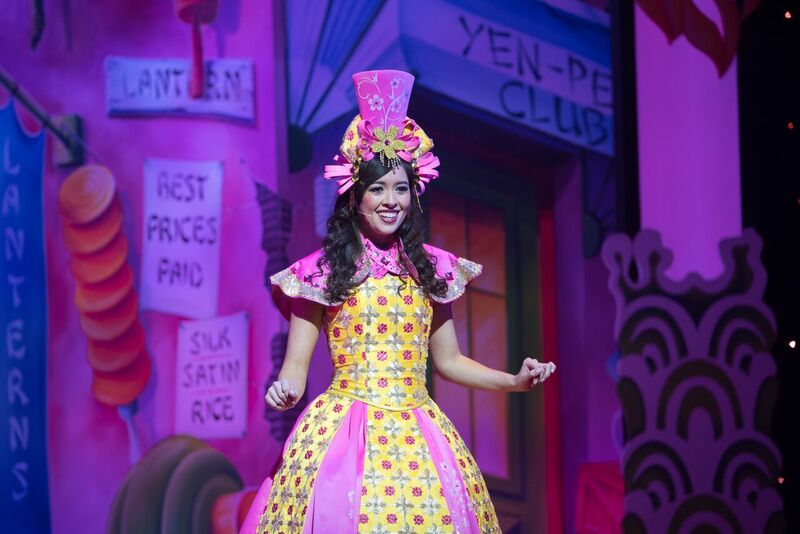 McCowan’s energy is non-stop, still swaying enthusiastically through the finale until the final curtain falls. A chance to sing “Defying Gravity” on a big stage is grabbed, her effort far outshining the rather disappointing The Twins FX carpet. If they are reading this, the boom is all too visible from the side stalls, gentlemen. Sadly, this year’s ensemble appeared tentative in their first public outing. Probably coming up to speed as the run continues, there was little pep or panto stardust flowing. The same can be said of the entire show’s pacing, and the Alan McHugh script seemed over-stretched. In fact, the whole show feels far less lavish than usual and rather last-minute in places. The extra Merton / Firman additions padding, the 3D films, though well-executed, another means of extending the running time rather than adding to the vital theatricality. The animated genie in particular was a horrid rip-off Disney / Poo Emoji hybrid. The peculiarity of confusing several “non-Western” cultures visually and in music (Jasmine entering to “March of The Siamese Children”?!) rounded off the oddities. Not a vintage year for Wimbledon, but some truly great performances and potential by the end of the run for the teamwork to come together and become a nucleus from which to build in the future. Photo credit: Craig Sugden. Used by kind permission of the New Wimbledon Theatre. ← Lea Michele and Darren Criss In Concert: Hammersmith Apollo and touring.